Headlies: The OGz To Face LAX In A Lowrider Sumo Match - WrestleCrap - The Very Worst of Pro Wrestling! Toronto, Ontario CA – Following the horrific hit-and-run murder of their friend Richie, LAX have vowed revenge on The OGz by challenging them to a lowrider sumo match. 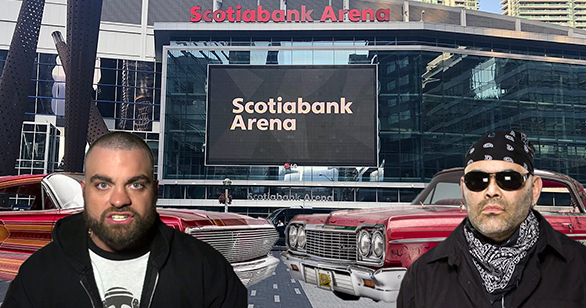 Per the strict rules of Impact Wrestling and the incredibly negligent Toronto police department, LAX will face The OGz in a lowrider sumo match atop Scotiabank Arena. Both tag teams will use their respective cars to push the other off the roof, presumably to their demise. “What’s a ‘murder’?” asked Toronto chief of police Mark Saunders when asked about the situation. He then took a sip of maple syrup and apologized, as is Canadian custom. It is currently unclear how Impact Wrestling is planning to get the vehicles on top of the arena. Impact leadership have thrown around ideas including using cranes to building the cars piece by piece on top of the roof. Scotiabank officials have declared that the match cannot interfere with local lacrosse team the Toronto Rock’s game earlier that day. Impact Wrestling will present this life-or-death struggle on free television next week. 3 Responses to "Headlies: The OGz To Face LAX In A Lowrider Sumo Match"
But for those dozen or so people that will watch the show it no doubt may effect them for at least ten seconds after it’s over. I briefly forgot what website I was on when i read that headline and thought this was actually going to happen. Bonus marks for the Toronto Rock mention, the lone champion team in the Scotiabank Arena (formerly the Air Canada Centre, now nicknamed by the millineals as the “Bank”) instead of the obvious teams. 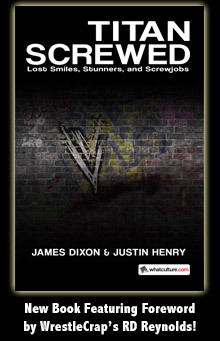 Guess the WWE overkilled on the Toronto Maple Leafs and Raptors insults that once more Impact had to settle for what’s left. Oh and it’s easy to get cars on the roof, drive them off the DDP highway nearby…ok that’s a bit dark but so was the Impact angle not needed as they were doing some good shows beforehand and are back to where they started: one step forward, many steps back.